The Defence Forces have further increased their deployment due to the recent flooding. The Defence Forces now have approx 175 troops, 24 vehicles, four flat-bottomed boats and well over 10,000 sandbags deployed. They have troops deployed in Cork city, Bantry, Clonakilty, Clonmel, Ennis, Ballinasloe and, most recently, to Carlow town. They have 300 further soldiers, with vehicles and helicopters, on stand-by 24 hours a day over the weekend with troops confined to barracks in order to replace the troops that are deployed at the moment. The Defence Forces expect operations to continue for 48 to 72 hours. They are providing 24-hour assistance in the affected areas, including over-flights of the affected areas by Air Corps helicopters to improve the situational awareness of the County and Town Councils. Meanwhile, the Minister for the Environment, John Gormley has travelled to Cork to inspect the damaged caused by the recent heavy rain and flooding. The Minister will also visit other affected regions and report back to a meeting of the Emergency Task Force tomorrow. Earlier, the Taoiseach praised the work of emergency services but warned things could get worse before they get better. The Taoiseach said providing shelter for those displaced, as well as clean drinking water, were priorities. The west and south are the worst affected with up to one metre of water reported in some areas, following some of the heaviest rainfall in decades. A number of roads are closed and some bus and rail services have been cancelled. People have been advised not to travel unless necessary. He said tankers would have to be provided to deliver drinking water to Cork, where there is only about one-and-a-half days worth of uncontaminated drinking water in reservoirs. Many homes and businesses in Cork city were flooded when the River Lee burst its banks overnight. The city's water works have also been flooded and disruption to water supplies is expected. Many areas of Cork city and county are without water and are likely to be without water for several days. The city's main water treatment plant on the Lee Road was badly damaged by flood waters. Crews are on standby, waiting to assess damage and carry out repairs. However, water supplies to the northside and some areas on the southside have been badly disrupted. The City Council has arranged for tankers to supply emergency drinking water to the public at locations in the city - including Blackpool, Holyhill and Ballyvolane Shopping Centres, as well as Nemo Rangers GAA Club. The Accident & Emergency unit at the Mercy Hospital has been closed after the quay wall beside the hospital at Grenville Place collapsed. The hospital confirmed that 'damage control strategies are being put into place'. Problems are being caused by the volume of water passing through the ESB's Inniscarra dam. The ESB says it has to release significant amounts of water downstream of the dam because the dam is dealing with up to eight times the amount of water that it normally handles. It says flooding downstream of the Inniscarra dam is inevitable under the circumstances. Water levels remain high in other parts of the county, particularly in Bandon and Fermoy. Currently around 150 homes in the east Galway area are still without power as networks had to be switched off for safety reasons due to the severe flooding. The ESB said power is gradually being restored to homes as the water is receeding and not all 150 will be without power overnight. A giant Christmas tree, which had been placed in the Shannon River in Limerick, has come loose from its moorings and collided with the Shannon Bridge. The tree - which is over 100 feet high and made of recycled steel - was to be lit this evening, but shortly before 7pm it drifted down river and collided with the bridge. Gardaí have closed the bridge to traffic and diversions are in place. University College Cork has cancelled all its lectures because of flooding in various buildings on the campus. The University has said classs will be cancelled until 30 November due to the flood damage. The official opening of the €23m Cork's County Library on the Carrigrohane Straight, which had been due to take place today has been cancelled. Cork County Hall has also been closed. 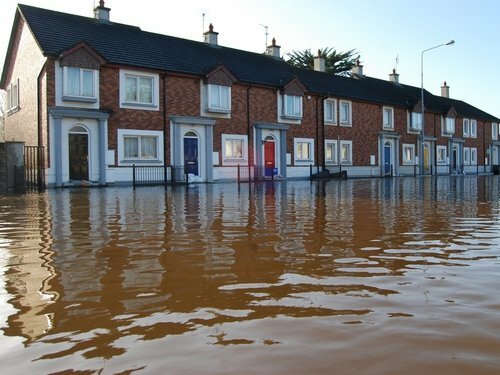 Speaking on RTÉ’s Morning Ireland, the Minister of State with responsibility for the Office of Public Works, Martin Mansergh, said local authorities could apply for a minor flood relief scheme introduced earlier this year. He also said that major relief schemes in towns traditionally affected by flooding were being implemented. An Post has said that mail deliveries have been disrupted in the flooded areas. It said there were difficulties transporting mail for local delivery this morning. And the ESB says all power has been restored to Athlone town. A coastguard helicopter was called to help rescue a family in Galway whose house was surrounded by rising floodwaters. The five members of the family in Kilbeacanty, including an 87-year-old woman, were winched from the house by the helicopter crew in an operation that lasted for almost three hours. Galway County Council has confirmed that 26km of the M6 Dublin-Galway Road, which is still under construction, will open temporarily later, to bypass the flooding at Ballinasloe, Loughrea and Craughwell. Single lane traffic will be in operation and a strict speed limit of 50km/h will apply. Major diversions are in place around the towns of Gort and Ballinasloe, where 40 families had to leave their homes. Other badly affected areas are Ennis in Co Clare, Clonmel in Co Tipperary, Enniscorthy in Wexford and parts of Kilkenny and Waterford. The Lake Hotel in Killarney, Co Kerry, was evacuated after the level of Lough Leane rose four feet overnight. Speaking on RTÉ's News At One, the hotel's General Manager, Niall Huggard, said 150 guests had been due to stay at the hotel tonight. Iarnród Éireann has advised customers that train services have resumed between Galway and Athlone. As a result, full rail services are operating again between Galway and Dublin. However, all Bus Éireann services remain cancelled until further notice. Cancellations and delays are still affecting rail routes between Dublin and Cork, Limerick and Ennis and Dublin and Sligo. The bad weather has eased today, but gales and heavy rain are forecast for tomorrow.